I thought it would be fun to post a couple "Eye of the day" pictures to break up to monotony of having only nail pictures. What do you think? I love makeup of all types. Playing with color is so much fun! This is Ben Nye Aztec Gold, Tangerine and Azalea, MAC Goin' Bananas and Vanilla, Urban Decay Peace and Fishnet, and 24/7 liner in Electric. There might have been some other stuff, but I can't remember what. This was a fun look- antique looking. MAC Nanogold, Off The Radar and Mega Rich, Urban Decay Peace, and liner in Honey. Nice change of pace from posting nail polish all the time, right? keep this idea of posting eotds - so cool! You have a lot creativity! I enjoy your pics of applied makeup, although they are rare. Gurl, you got skills! Love all of the looks!!! The first one reminds me of a rainbow! Very pretty and eye-catching. This reminds me of myself, back in the day before I became a mom and I would go clubbing every weekend and all i would think about was what i was going to wear, and how i was going to do my make up! What fun! I was so good at it that i would have a line of girlfriends at my house waiting for me to primp them up! Oh how i miss those days. You enjoy those to the end girl. Fabulous job!! The second one is my favorite. I do similar things with shadow and our application technique is fairly close. I haven't done much with colored eyeliner. I usually use the gel eyeliner from MAC in black just on the top. I should branch out a bit with eyeliner. Funny thing, the guy who owns the coffee shop around the corner has taken to noticing my nail lacquer changes and and remarks on the colors. I think it's hilarious (also nice) since he usually talks about about coffee and golf. (I don't play golf) Now he talks about my nail polish. LOL! It's a good way to be my friend: give me coffee and talk about my nail polish! You are a gorgeous, talented woman! I love any of your posts, so definitely post anything you like! Do you find that colour becomes more attractive over the fall and winter? I know that once the trees are bare, I can't get enough of my nail polish, makeup, and gardening mags :). Just want to know if I am not the only one! Hawt! Your blending skills are amazing. I love the pics and color choices!! Oh my goodness, such a beauty! More Scrangie to the people! Ray.of.night, yay, I think I will, thank you! Erin, wow, thank you thank you!!! Tarotbydiana, oh I love colored liner but black goes with everything :) Sometimes I use MAC pigment or eyeshadow as liner and it looks awesome. I also love that you're found someone who will comment on your nails in a positive way (I usually get, "eww neon green??" :D That's awesome! Melli, awwwwww thank you, you are so sweet! I do find color becomes more attractive then- and I get sick of color in the summer when it's everywhere and I'm sick of seeing it in a week, lol. But I do love fall more than any other season and loooove doing fall colors of gold, red, orange and brown... so pretty. I love the first! Where can you find Ben Nye products? 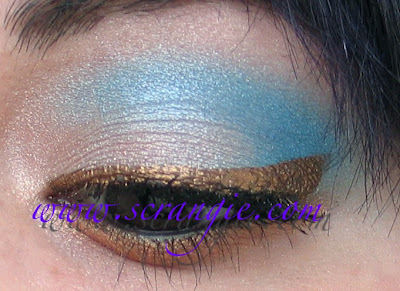 And the 2nd one looks like a good "Cleopatra" eye! :D Oh and you have gorgeous lashes! Great post! I love seeing people getting experimental with red shadow. I am not brave enough to try it, but it looks so great with your dark eyes! I hope you do more make up pictures on the blog. P.S. Went to Nordstrom today to pick up 3 Dazzleglass colors (toppings??) since TODAY is when they were released. Also bought Adoring Carmine: 3 rose lips... and Soft Pause. mmmm... I love me some new makeup!! Oh this is breathtaking! Beautiful colors and amazing eyes! dear Scrangie ,please, tell me ; how you made this gold/honey line ?wow !Is it pigment MAC or... ?